WhatsApp, the king of the mobile message app, helped Jan Koum and Brian Acton to create a most successful entrepreneurs, where the app has become a basic need of mobile, as it is used by millions of people across the globe. Jan Koum, CEO and Co-founder of WhatsApp, Born in the Ukraine, Koum and his mother immigrated to California when he was 16 and got an apartment through government assistance. He grown up in Fastiv, and in 1992 shifted with his mother and grandmother to Mountain View, California , where a social support program helped the family to get a small two-bedroom apartment, at the age of 16. His father was in Ukraine. Koum’s mother worked as a child care provider, while he worked as a cleaner at a grocery store. By the age of 18 he increase interest in programming. He register at San Jose State University and simultaneously worked at Ernst & Young as a security tester. Koum swept floors to make ends meet. When his mother was diagnosed with cancer, they lived off her disability. He had a knack for computers and got a job working at Yahoo as a security and infrastructure engineer for nine years under Yahoo cofounder and fellow billionaire David Filo, before leaving in 2007. 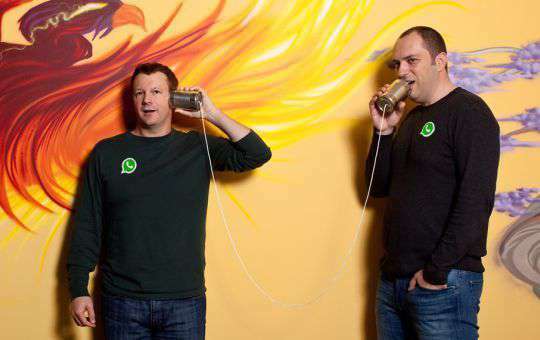 In 2009 Koum started WhatsApp, now the world’s biggest mobile messaging service with 800 million users. Facebook bought it for $19 billion in cash and stock in 2014; Koum sits on Facebook’s board. In October 2014 Koum donated roughly $555 million of Facebook shares to the Silicon Valley Community Foundation, which provides grants for local needs, and has anonymously diverted some of the funds to several undisclosed causes. Brain Acton, Co-founder of WhatsApp, born on 24 Feb, 1972 in Michigan. Brain grown up in Central Florida. His mother used to run a freight shipping industry. There was a big moral support from her mother to start his own business. Brain did his graduation from Lake Howell High School. Later on, he has completed his Degree in computer science from Stanford University in 1994. Brian Acton started his career from the scratch in the year 1992. In 1992, he serves as a systems administrator for Rockwell International, before becoming a product tester at Apple In. and Adobe Systems. In 1996, he became the 44th employee hired by Yahoo Inc. Earlier, he also studied at University Of Central Florida and University of Pennsylvania. In 1998,while working with Yahoo Acton met Jan Koum, an Infrastructure Engineer at Yahoo.They worked together at yahoo for nine years. Acton invested in the dotcom boom, and lost millions in the 2000 bust. In September 2007, Jan Koum and Acton left Yahoo and year spend on traveling around South America and playing ultimate frisbee. They applied for Facebook and got rejected. In January 2009, Koum bought an iPhone and realized that the ‘then-seven-month-old’ App Store was about to spawn an entire new industry of apps. He decided to make his own mobile app, he met his friend Alex Fishman and expressed his views about developing an app. Koum chose name as WhatsApp because it sounded like “what’s up,” and just after a week on his birthday, Feb. 24, 2009, he incorporated WhatsApp Inc. in California.In February 2014, WhatsApp acquired by Facebook Inc. for US$19 Billion.